Contributions, no matter the amount, will make a difference in treating thousands of patients. Please consider donating today. Give the gift of a smile… doesn't everyone deserve one? Tributes are a heartfelt way to recognize a family member, friend, or colleague. Recipients of tributes are notified by mail of your gift. See how your donations make a difference. Financial donations and in-kind contributions may be made through the Rhode Island Oral Health Foundation to help cover $97,000 in dental equipment, instruments and materials, supplies, pharmaceuticals and food costs for this two -day charitable care event. Donations may come in the form of funds, supplies, donated meals and/or snacks, and a variety of other support items. The RI Mission of Mercy clinics are 100% volunteer operated and patients incur no costs. The RI MOM events delivers, on average, $5 to $7 in critically needed dental care for every donor dollar received. The Rhode Island Oral Health Foundation is raising private donations to cover all the costs associated with the event. Contributions, no matter the amount, will make a difference in treating thousands of patients. All donations are guaranteed to put a smile on the face of a deserving patient. Please consider donating today. 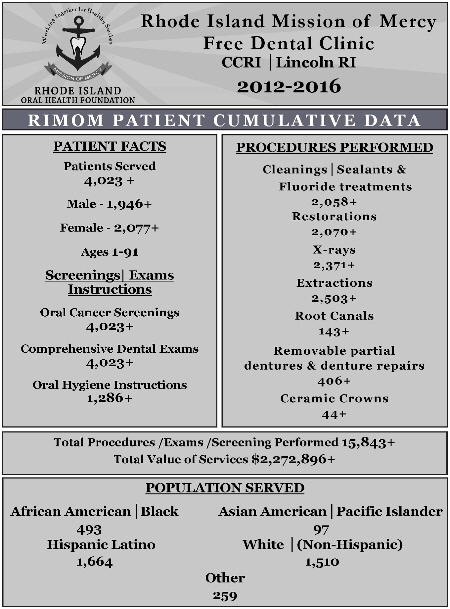 The Rhode Island Oral Health Foundation is a 501(c)(3) nonprofit organization. Please contact your tax preparer for deductibility on your tax return as a charity or business expense.